BMG LABTECH – The Microplate Reader Company – offers a wide range of microplate readers for a multitude of applications in life science, drug discovery and research. No matter what your assay, BMG LABTECH offers multimode, dedicated and HTS microplate readers to fit your application needs. Most of BMG LABTECH’s dedicated microplate readers are also upgradeable to powerful multi-mode microplate readers when the need arrives. The modular concept of the multi-mode microplate readers allows additional detection modes, reagent injectors and other features to be upgraded at any time. 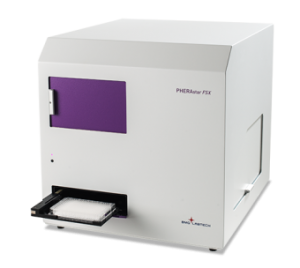 The PHERAstar® FSX is our latest, most sensitive multi-mode reader, combining this sensitivity with fast read times. Thanks to the unique Optic Module system, Simultaneous Dual Emission, UV/Vis spectrometer, and dedicated AlphaScreen® and TRF Lasers, whatever your application, the PHERAstar FSX will perform it with ease and speed, even in 3456-well microplates. 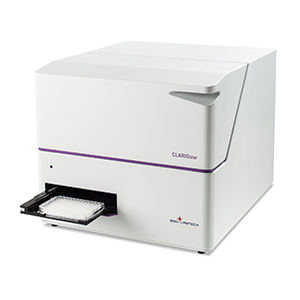 The CLARIOstar® is BMG LABTECH’s newest microplate reader, equipped with revolutionary LVF monochromator technology. Thanks to the triple technology, monochromators, filters, and spectrometer, it does not compromise on sensitivity or flexibility. As well as its high performance in all detection modes, the CLARIOstar’s versatility also makes it ideal for assay development. The fully-equipped Omega-series microplate reader, offering all the features of a FLUOstar Omega, and in addition fluorescence polarization. Equipped with BMG LABTECH’s ultra-fast UV/Vis spectrometer and Simultaneous Dual Emission detection, the POLARstar Omega represents a great combination of performance and flexibility for life science applications. SelectScience Best Drug Discovery Product 2010, the FLUOstar Omega is a multimode microplate reader with five detection modes. It utilizes an ultra-fast UV/Vis spectrometer or filters for absorbance as well as highly sensitive filters for all other detection modes. The FLUOstar Omega is the ideal plate reader for life science applications. 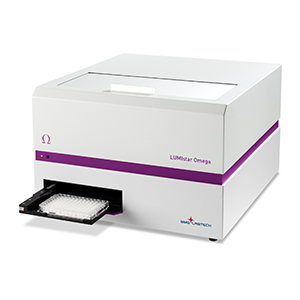 The LUMIstar Omega is BMG LABTECH’s powerful dedicated luminescence microplate reader, providing highly sensitive flash and glow assay readings. This DLReady-certified microplate reader can also come equipped with Simultaneous Dual Emission for BRET applications, and can be further upgraded to a multi-mode reader. 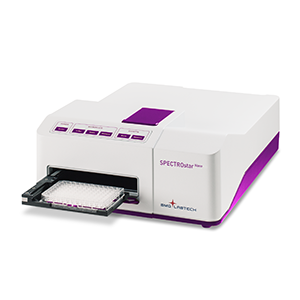 The SPECTROstar Omega is a dedicated absorbance microplate reader that can capture a full absorbance spectrum (220 – 1000 nm) in less than 1 second per well – no scanning needed. This upgradeable reader offers the highest flexibility for optimizing settings for all absorbance-based assays. The LVis Plate compatibility allows for low volume sample measurements. BMG LABTECH’s innovative absorbance microplate reader has the flexibility to perform assays quickly and easily in both microplates or via the built-in cuvette port. This spectrometer-based absorbance microplate reader captures a full UV-visible spectrum in less than 1 sec/well. Its speed, simple push button operation, and capacity to store individual assay protocols make the SPECTROstar Nano the ideal microplate reader for absorbance measurements. The world’s first and only laser-based microplate nephelometer was developed to meet high-throughput demands for fast compound solubility screens. The NEPHELOstar Plus detects insoluble particles in liquid samples by measuring forward scattered light and can be used for turbidity measurements, drug solubility screening, protein binding kinetics, microbial growth, and petroleum process control.